FF: The Murray Hill Club Bourbon from Jos. A. Magnus & Co. The fine folks at Jos. A. Magnus & Co. make some pretty nice spirits, like their Murray Hill Club Blended Bourbon. 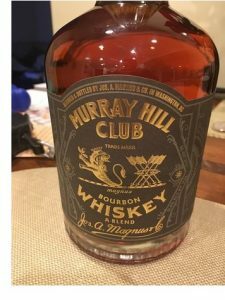 Learn more about the Murray Hill Club Bourbon from Jos. A. Magnus & Co. here. Visit Jos. A. Magnus & Co. online here. Meanwhile, a nice mixer to make a cocktail with your bourbon, is the Mint & Lemon Verbena I found from the fine folks at Louisiana-based Cocktail & Sons. Find the Mint & Lemon Verbena from Cocktail & Sons here. Find all the fine syrups from Cocktail & Sons here. Lost Cowboy is powered by	WordPress 5.0.4 and delivered to you in 1.859 seconds using 48 queries.